This weekend I made some serious progress with B's room. I painted the bed and re-upholstered his headboard. We originally built this bed a couple of years ago after I had tried to find a queen bed with a trundle without any luck. I thought it would be great with more sleeping space for guests or sleep-overs that B might have and it has seen plenty use. So we beefed up the center post by going from 1x3 to 2x3. Much more solid. That, then gave us the problem that the trundle did not fit under the post any longer. I pondered my options for a while, then decided to have extensions put on the end boards, raising the overall height of the bed. I had my handyman do that part because I don't have a table saw. Here you see the new end boards with the new wood attached at the bottom. The end boards measure 61 3/4 x 18 ". If I had to build it again, I think I would make that 62 x 18 for just a tiny more room for the slats. The side boards are made of 1x6 pine with a 1x2 strip attached to hold the slats. Those boards are 80" long. The last board for the right side as well as the board that is on the trundle is 9 inches tall. On the trundle we cut it down to 79" to have room to roll it under the bed. The bed is assembled using these surface mounted bed rail brackets by Rockler. As you can see I added brown felt on top of the wood that will hold the slats. Here is the beefed up holder for the T post. A 1x4 with a notch to hold the T. We made it this way so that it is the bottom of the T that is supported, not just the top of the T.
> Here is the T post. Here are the four pieces of the bed - held together by the brackets. This has held up really nicely. The brackets go together very sturdily. We did however add that fifth board on the right hand side (not pictured) to secure the bed to a square shape - instead of a diamond shape if you pushed on it. I added felt to all the wood that would be touching wood to silence any squeaking. Including on top of the center post. And YAY the trundle with mattress now fits under center post again. We used some screws to hold the IKEA slats in place like this. That's how we build the queen size bed. On the Odda pull out bed we cut down the board so that the trundle would fit with our bed. Then, we attached our own board and added a quarter round to finish off the raw edge from our cutting. Here is a picture of that after I primed the front of the trundle. And here is a close-up of it after it's been painted. 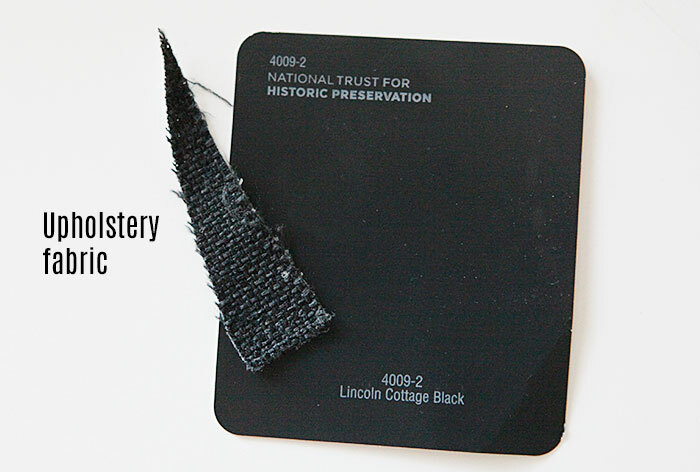 We painted the bed Valspar's Lincoln Cottage to match the upholstery fabric for the tufted head board. Both mattresses are from IKEA as well. For the trundle we got the Sultan Florvåg. It is just shy of 4 inches tall. For the queen bed we got the Sultan Fåvang. The Fåvang is the mattress B is sleeping on every night, so we went with one of the better quality mattresses that they have. 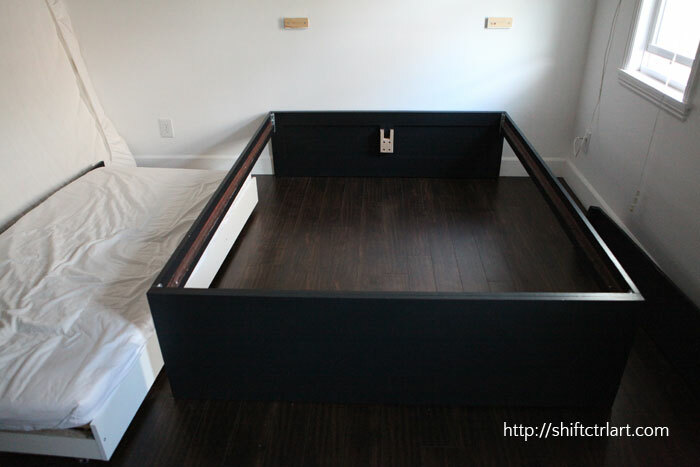 This article: How to: build a queen bed with twin trundle - IKEA hack first appeared on http://ahomefordesign.com.